Once again, Billy Joel’s lyrics–“Only the Good Die Young”–are proven true, as Marguerite Ann Johnson a/k/a “Maya Angelou” dies at age 86. 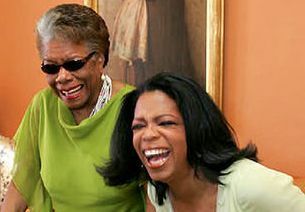 Angelou was America’s most overrated crappy writer, all because she was Black . . . and a far-leftist. Angelou was a racist, America-hater, Jew-hater, anti-Israel, a close friend of Malcolm X, and a strong supporter of Cuba’s Fidel Castro. No, she actually hadn’t a clue why the caged bird sings since she supported the caging and the cagers all the way to her grave. I was one of the lucky American kids who was never forced to read this Friend of Oprah cretin’s god-awful “writing,” the most overrated dreck on paper. Sadly, high school and college students all over America are forced to wade through her written bath of dung because it’s chic among the brainless radicals who dominate American education at all levels. It’s absolutely unreadable. The ugly empress–inside and out–definitely wore no clothing. And you probably don’t know this: the overrated, talentless hack, Angelou, was a madam and a prostitute, and an America-hater who left the country to go live in Africa and didn’t intend to return. But she came back, according to the book, “Maya Angelou” by Vicki Cox and Miles Shapiro, only because her good friend, Malcolm X, implored her to return to America, so she could help him attack U.S. racism in the United Nations and help him build the Nation of Islam, which he claimed was the civil rights movement. Can you name a single thing this leftist radical, Angelou, contributed other than hate (and very bad “poems”)? I cannot. And even though she made an appearance at every violent, far-left, radical cause’s events, ignorant conventional wisdom heaps praise on her as some sort of “peace activist.” She was no such thing. Angelou spoke at the racist, Jew-hating bigot Louis Farrakhan’s 1995 Million Man March and was a strong supporter of his Nation of Islam. Given this, it’s disgusting that, in 2001, Bill Clinton appointed Angelou to the board of the U.S. Holocaust Museum just before he left office, so there could be no firestorm or examination of her appointment. And, apparently, being on the board of the museum didn’t change a thing. Angelou spoke at 2006 New York rally honoring anti-American (and U.S. flag-burning), anti-Israel activist Rachel Corrie, who worked with Palestinian Islamic terrorists but was dubbed a “peace activist” because she was accidentally run over by a bulldozer when she attempted to stop Israelis from knocking down homes shielding tunnels through which her terrorist friends transported weapons and bombs to kill innocent civilians. Of course, Castro never had called himself white, so he was O.K. from the git. Anyhow, America hated Russians, and as black people often said, “Wasn’t no Communist country that put my grandpappa in slavery. Wasn’t no Communist lynched my poppa or raped my mamma.” . . . I hovered with my friends on the edges of the crowd, enjoying the Spanish songs, the screams of “Viva Castro,” and the sounds of conga drums being played nearby in the damp night air. It was an ole and hallelujah time for the people of Harlem. Angelou was an activist in trying to get cop-killing Muslim Mumia Abu-Jamal released from prison. And she wanted her many idiotic fans to know–on the 11th anniversary of 9/11–that Islam had nothing to do with 9/11 or terrorists. Gee, and you wonder why Muslims and other America-haters/Jew-haters loved her so much. Attacking America and idolizing the far left is big money. Throughout all of this, Angelou made millions off of her indignant, lecturing speeches and appearances, attacking America from within, and laughing at her myriad stupid fans all the way to the bank . . . just like her good friend and ceaseless promoter, Oprah. Maya Angelou did nothing good for America–not in her Grade A Gitmo Torture Material “writing” and “poems,” not in her many pretentious speeches and pronouncements. But she’s being lauded today by the many liberal morons across America who worship at the altars of yoga, gluten-free, Priuses, and ADHD. They like their gods empty. Maya Angelou is one of those IQ tests pop culture presents us with all the time. If you’re a fan of Angelou, you failed miserably. I hope she packed light because it’s very hot where she’s headed. Maya Angelou, Rot In Hell. If anyone ever wondered why the Nation of Islam referred to racist white pigs as DEVILS…This thread answers that question. I wish you brave computer activist would show your faces in public, trust us there is no more turning the other cheek…fire vs fire devils! Alfredo’s message was delivered in a smart and witty manner….jealous?….that all you can do is threaten, name call and over use invective ? No Milton, YOU’RE the one who missed a few things, like all the blacks that DEBBIE has lauded on this web site, not just the ones I mentioned. But then again, your own threats and vile language do nothing but expose you for the phony you are. And don’t pull the tough guy act on me. I’ve broken bread and shared joints with geeks, gangsters and everything in between in my life. You don’t scare me one bit, but you are afraid of truth, I can see that plainly. 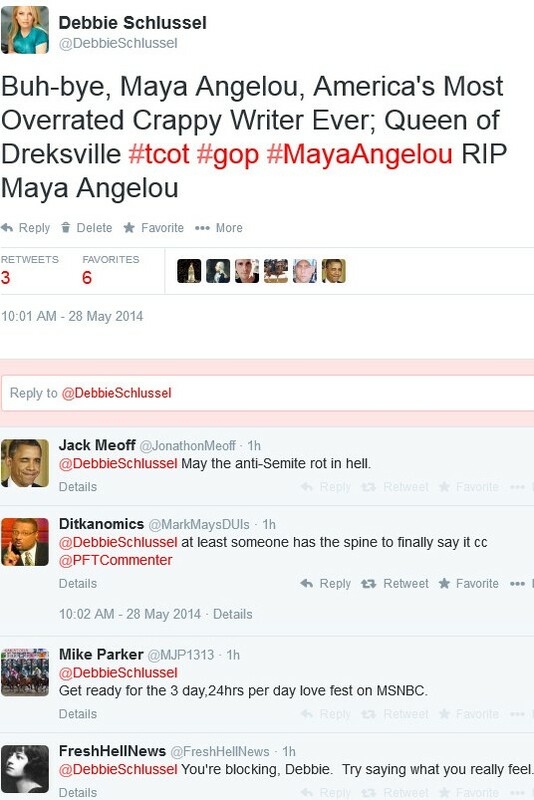 Maya Angelou was not a contributor to America, nor one to be lauded and fawned over. Did you happen to check out the archives? Debbie has plenty of blacks that she’s been generous to with complimentary articles. Why don’t you check out her lament on the downfall of her neighbor, one Mr. Thomas “Hit Man” Hearns. Very sad story, and very sensitive article, too. Your insistence on defending the indefensible is laughable. You are no one to talk about God, and then launch in to your curse laden diatribes against Debbie. That’s NOT what Jesus would do. And for the record, and I AM on record right here on this web site, at certain points during my year and a half of participation, as saying that I don’t necessarily agree with Debbie’s approach to everything, or every sentence of every article she writes. But yes, I DO support her, and by the way, I LOVE Rush. I’m a 24 year listener, but ya know what? I like Mark Levin even better. Just what American needs, another bargain-basement Ann Coulter wannabe. It it possible to dumb it down further, please? Debbie’s been around just as long, if not longer. Ann Coulter herself has plagiarized Debbie’s work. But Debbie doesn’t compromise as Ann and many others do. Welcome to The Unvarnished Truth, not the ice cream cone with pretty colored sprinkles and dressed up to look hypocritically compassionate truth. let me guess…. you are Jewish? I agree with you . It’s about time someone exposed Maya Angelou for who she really was! Okay, you think she’s over-rated. No need to wish eternal damnation on her. She inspires a lot of people and encourages them. If you don’t get that, you don’t need to undermine those who do and be condescending. I don’t understand how you can think she’s racist. I hope you’ve read all her autiobiographies and poetry before you came to the conclusion that she was incapable of writing. You would not want to be one of those brainless radicals you accuse people of being for having a good opinion of her. Because from where I’m sitting, that’s exactly what you sound like in this post: a brainless radical. Angelou said “hate has caused many problems but has yet to solve one”. I hope you can stop hating because it’s a curved blade and you’re only hurting yourself. She’s dead and gone. She lived a full life that inspired others to love. You are writing hateful blogposts that achieve nothing. Except serve to have now wasted my time in replying. Thanks for the article exposing the rotten POS. Search engines have been scrubbing queries critical of Saint Maya and loading up results only with praise for the irritating old wind bag. Scott, how about you read the REST of that passage instead of those first three verses? The Book of John, Chapter 7, and Verse 24. I call game, set, and match on you, servant of Lucifer. I stumbled upon this site while doing a Google search of “Maya Angelou is overrated”. What I found was an incredibly hate-filled, ignorant, immature individual who is maliciously tearing apart Maya Angelou, meanwhile is a far worse human being. I think Maya Angelou was merely a pretentious, overrated hack. You, on the other hand, are a truly disgusting human being who sincerely deserves to vurn in hell. PS: Rachel Corrie was a terrorist?? Wow. You are profoundly sick and deluded. Typical Fox News-type idiot. If we lived in the Old West or a 3rd world country, I would honestly kill you, just to rid the world of ignorance and arrogance such as you display. You’re extremely fortunate. Quite an interesting read. I always wondered about this Maya Angelou and what made her so popular when she should not have been even recognized. So, after reading this article, I’ve done some research on my own. Lo’ and behold, the results pretty much fits the article. Not to mention a bunch of other un-deserving fame that some other people received over the years whether white or black. I hope that you get around to researching and exposing more of those people. I chuckle knowing that thirty, fifty, even a hundred years from now, there will be a digital record of the things that you have said. Some of your relatives will get to look back and slap their heads in disbelief at the utter ignorance you once spewed. Reading something as vile as what you have said here would have once made me pretty upset. Now, I sit back and let the future generations embarrassment of you, warm my heart. Carry on, miserable person…carry on. Thanks for giving wings to my thoughts. Turned over some stones, too, apparently.